The first thing you'll notice when you get to Saffron City is that it's a pretty big city. 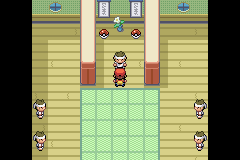 The next thing you'll notice is that everywhere you go, you'll find Team Rocket members. The first problem to take care of in this city is Team Rocket. To get Team Rocket out of the city, go to the Silph Co., the large window filled building with a member of Team Rocket next to it. 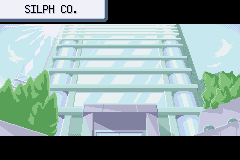 Now you must go through eleven floors, fighting Team Rocket, and in the end, saving the company's president. The first floor is empty. Go up a floor by taking the stairs at the top-right corner. Remember, your goal is to reach the top floor and save the president. However, you cannot go directly to the top floor. Also, keep in mind that you will be finding warp squares on the ground. Stepping on them will take you to different places in the building. If you want to go through all this faster, then take the elevator to the 5th floor. However, I suggest that you go up the floors one by one, as you may miss out on valuable items. Once on the 5th floor (if you chose to go there right away), go left and down all the way until you see a warp square. Step on it, and it'll take you to the 9th floor. Step back on it, and you'll return to where you were. Proceed by going to the right, where you'll find an Itemball containing the Card Key, which is used to open any locked door in the Silph. Co. Now that you've gotten this important item, you can explore the Silph Co. by battling Team Rocket and picking up a couple of items, including TMs. There's even a Move Tutor who'll teach your Pokemon Thunder Wave on the 2nd floor. Open all the locked doors just for fun, and because you simply can, and try every warp square. 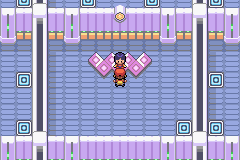 If you ever need to heal your Pokemon, you can do so on the 8th floor by sleeping on the bed. When you're done exploring, head to the 3rd floor, and open the door on the left with your Card Key. Take the warp square in the first room, and you'll be teleported to a room on the 7th floor. Here, Gary will challenge you to a battle. As usual, Gary's team has gotten stronger, and hopefully, your Pokemon can take care of him. After defeating him, talk to the Silph Co. employee in the same room and he'll give you the Pokemon Lapras. Use the other warp square to get the the 11th floor. Go into the enclosed area, and Giovanni will challenge you to a match. Giovanni has the following Pokemon: a lv. 37 Nidorino, a lv. 37 Rhyhorn, a lv. 35 Kangaskhan, and a lv. 41 Nidoqueen. After defeating him, Team Rocket will leave the building and the city. Go to the old man sitting on the sofa, and talk to him. He's the president of Silph Co., and he'll give you the Master Ball. 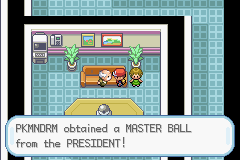 There is only one Master Ball in the whole game, and it catches Pokemon 100% of the time. Now that this problem is taken care of, get out of Silph Co. and head north to the Fighting Dojo. You'll be challenged by four trainers inside the Fighting Dojo. They all use Fighting Pokemon, who are weak against Psychic and Flying Pokemon. After challenging the four trainers, the leader, who has lv. 37 Hitmonlee and Hitmonchan, will challenge you to a match. After defeating him, you will be able to take a free Hitmonlee (left PokeBall) or Hitmonchan (right PokeBall). After this, it's time to go to the real gym to get your fifth badge. The real gym is right next door of the Fighting Dojo. The trainers here use Psychic Pokemon, so Dark Pokemon/attacks will be quite effective here. This gym is filled with warp squares that take you to different rooms, and in order to get through them quickly, follow these steps once you reach the first room. Take the only warp square. Take the bottom-left warp square. Take the bottom-left warp square again. Take the top-right warp square. You should be in the gym leader's room. Sabrina is the gym leader, and she has powerful Psychic Pokemon. You'll be battling a lv. 38 Kadabra, a lv. 37 Mr. Mime, a lv. 38 Venomoth, and a lv. 43 Alakazam. All these Pokemon are female, even the Mr. Mime! After defeating Sabrina, she'll give you TM04 - Calm Mind and the Marsh Badge. There are two ways to reach the next city, which is Fuschia City. One way is to start from Celadon City and go through Routes 16, 17, and 18. This will take you through the Cycling Road, and is the prefered route for most people. The other way to get to Fuschia is to start at Lavender Town, and go along the coast through Routes 12, 13, 14, and 15. To find out how to get to Fuschia City through both ways, please proceed to the next page.